Elecampagne is a widespread plant in the sunflower family (Asteraceae). This plant has a long and interesting history as a medicinal herb wherein the rhizomes and roots were at one point used in a large variety of medical applications, primarily in the treatment of a large number of respiratory-type ailments. Today, the root is used in France and Switzerland as a flavouring for absinthe. Helen of Troy was believed to have been gathering elecampagne when she was abducted, hence the naming of the botanical name. 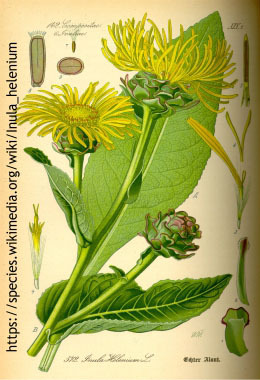 Inulin was first isolated from elecampane in 1804, and took its name from the botanical name for the plant. The root is known to have one of the highest concentrations of inulin of all plants. 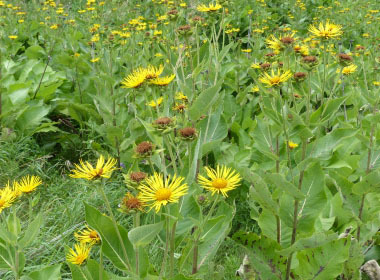 Distinguishing Features: Elecampane is a striking, rigid plant with an erect stem that can attain an impressive height of about 2 metres (6'). 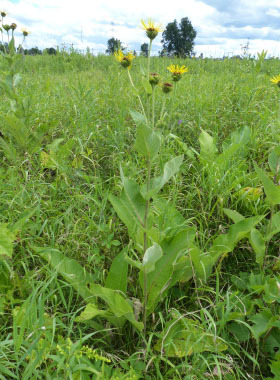 One plant can also spread up to 1 metre (3') in diametre. 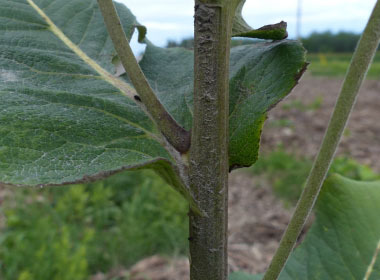 The rosette of very large leaves are toothed; the lower leaves are stalked, the upper leaves embracing the stem and they feel rough. It is stout and deeply furrowed toward the top. Flowers: Elecampagne flowers measure 6 to 8 cm (2.5 to 3”) wide, single flower-like capitula surrounded by involucral bracts. 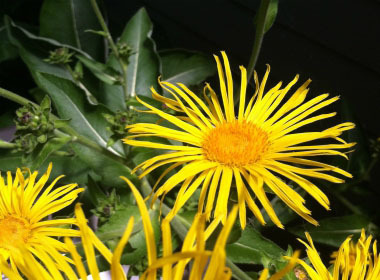 Flowers are yellow, have 50 to 100 ray-florets that are tongue-like; disk florets are tubular and small. It has five stamens. 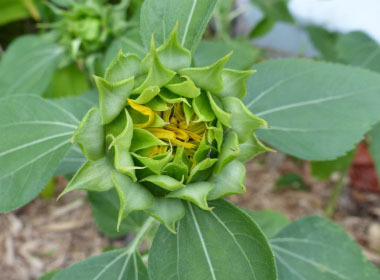 Involucral bracts overlap in many rows, outer ones leafy, ovate, recurved, hairy, inner ones membranous, straight. This plant blooms from July to September depending on geographical location. Fields of Nutrition has medicinal benefits and vitamin/mineral content of Elecampagne. 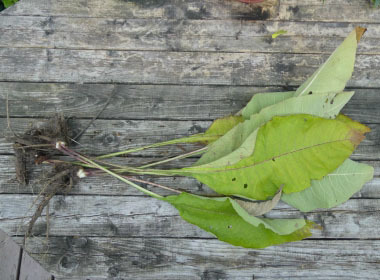 Leaves: Leaves grow alternate, basal leaves stalked, upper stem leaves are stalkless. Blade is elliptic, up to 70 cm (30”) long on basal leaves, cordate based, and densely toothed. The upper surface is rough and the underside is brownish tomentose. Height: This member of the aster family can grow anywhere from 60 cm to 2 metres (2' to 6') tall, but typically it is closer to 1.80 metres. 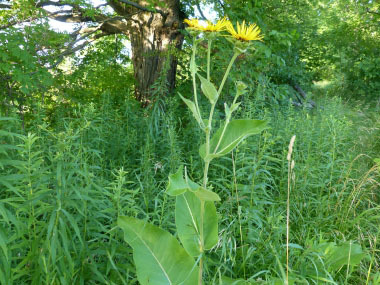 Habitat: This is a perennial plant that prefers fields, parks, roadsides, and pastures (sunny locations). Some people have these in their gardens. They can be found in Canada, the U.S., and it is native to Europe and Asia. Edible parts: Leaves and roots are edible. The leaves are better off cooked that raw as they are bitter. The roots contain up to 44% inulin so for some, this many cause gas. If thinly sliced, the roots can be candied. 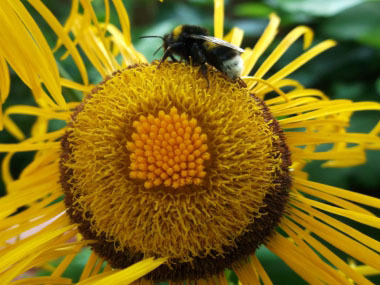 Elecampane root can be used as a natural food flavouring.